Able Friend is fast making a habit of turning Group 1 races into a procession. Hong Kong’s formidable miler this afternoon (Sunday, 25 January) trounced a top-class field for the second time in as many starts as he strode to an easy win in the HK$10 million Stewards’ Cup at Sha Tin racecourse. John Moore’s stable star was named the co-third best horse in the world at last week’s LONGINES World’s Best Racehorse ceremony thanks to a brilliant wide-margin triumph in December’s G1 LONGINES Hong Kong Mile. And the big chestnut emphasised his new found status with an easy length and a half win in the first international Group 1 edition of this 1600m contest. Joao Moreira settled the short-priced favourite toward the back of the nine-strong field as Gerald Mosse dictated steady fractions up front astride outsider Beauty Flame. Mosse kicked for home at the top of the stretch and the move found almost all of his more esteemed opponents caught for toe, all except Able Friend. As elite bracket stalwarts like Gold-Fun, Glorious Days and Ambitious Dragon struggled to quicken, Able Friend lengthened his raking stride and rapidly made ground. With Moreira no more than nudging the Shamardal five-year-old in pursuit, Able Friend’s effort was almost imperceptible, yet his progress was emphatic. The horse his trainer calls “Big Red” and the stable staff “Elephant” cruised to the lead to win as he liked. Moore was quick to praise the horse he hopes will get the chance to add to his tally on the international stage, sooner rather than later. “I’d have to rate him number one, in front of Viva Pataca,” he said, in reference to Able Friend’s position among the many good horses to have come out of the Moore stable. “The way he won today showed everyone around the world and in Hong Kong that he’s the best miler, but he’s got to go overseas to prove himself. On the local scene, people will always have their doubts. 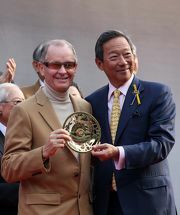 As to where in the world Able Friend might make his first overseas foray, Moore and Moreira were in agreement, although owner Dr. Cornel Li expressed reluctance to go offshore, at least until later in the year when he would be open to the Yasuda Kinen in Japan or Royal Ascot. The Brazilian was impressed with the way the horse quickened so easily off a slow pace to draw past runner-up Beauty Flame and win in a time of 1m 33.50s. Able Friend ran the final 400m in a swift 21.71s, the next quickest sectional being third-placed Rewarding Hero, who ran home in 22.22s, followed by Ambitious Dragon, who started his run alongside Able Friend but could manage only fifth with a final split of 22.24s. “He was even better today,” said Moreira “The pace didn’t suit him, they went slow up front, but he showed that he has a better turn-of-foot than any horse in the race. I’m just a lucky boy to be the one sitting on top of him today because he would have won with any other jock on top. Last year’s winner Blazing Speed was outpaced in the stretch after racing handily and kept on for fourth pace, while fellow big-name runners Gold-Fun and Glorious Days finished sixth and eighth, respectively. The Stewards’ Cup was staged as a local G1 contest prior to being raised to international G1 status this season. The race is the first leg of the Hong Kong Triple Crown, which continues on 1 March with the G1 Citibank Hong Kong Gold Cup (2000m) and concludes in May with the G1 Standard Chartered Champions & Chater Cup. All three races are worth HK$10 million and are open to international competition. Photo 1, 2, 3, 4: The John Moore-trained Able Friend (No 1) wins this year’s Stewards’ Cup (Group 1, 1600M) – the first leg of the 2014/2015 Triple Crown – at Sha Tin Racecourse today. Beauty Flame (No 7) and Rewarding Hero (No 6) finish second and third respectively. Connections of Able Friend celebrate their victory after the race. Photo 6, 7, 8: Dr Simon Ip (right), Chairman of the Hong Kong Jockey Club, presents the winning trophy and gold-plated dishes to Dr & Mrs Cornel Li Fook Kwan, owner of Stewards’ Cup winning horse Able Friend, and to trainer John Moore as well as jockey Joao Moreira. Club Chairman Dr Simon Ip, Stewards of the Club, CEO Winfried Engelbrecht-Bresges, and the connections of Able Friend, pose for a group photo after the Stewards’ Cup trophy presentation ceremony. (Frome right) Trainer, owner and jockey of Able Friend enjoy their happy moment.